We are a small starting business which specialises in removing waste or tidying up your property. The service is simple: You've got a mess around your house, you ring us, we come and clean it all out, we take, you're clean! 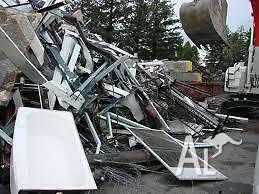 So, if you've got massive junk which you're sick of it laying around whether it's in your backyard, garage, house, street we'll come tidy up or take it for you. Minimum costs are $99, therefore jobs must be relatively big unless we do not need to use a triler and the job only requires moving around within your property.